St. Mary’s Cincinnati Alumnae Club Wins for OTS Outreach! Home/News & Events/St. Mary’s Cincinnati Alumnae Club Wins for OTS Outreach! St. Mary’s Cincinnati Alumnae Club Wins Club of the year for OTS Outreach! This dedication to help others is ingrained into the Cincinnati St. Mary’s Alumnae Club, and what led them to be the recipients of the St. Mary’s College Alumnae Club of the Year. On March 27th they accepted the award of St. Mary’s Club of the Year for their efforts in raising money, and program outreach to Off the Streets. St. Mary’s College Interim President Nancy Nekvasil came to Cincinnati to present them with this prestigious award, where she thanked everyone at CUB for their service to the women they serve. 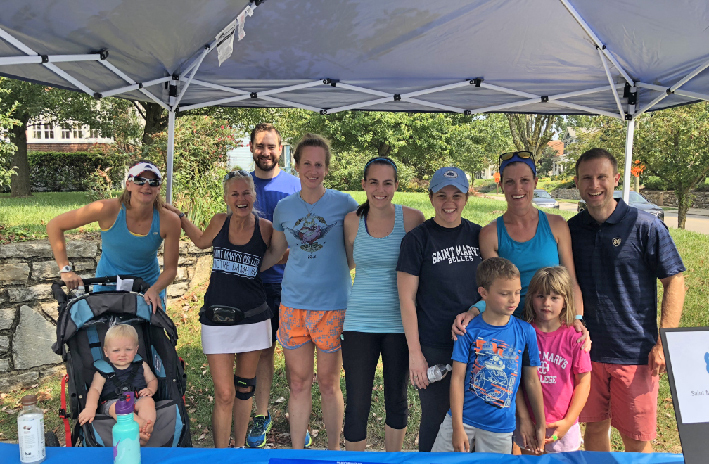 St. Mary’s Alumnae club organized several fundraisers for OTS which included Cincinnati’s Queen Bee half marathon and Laps Around The Lanes in Mt. Lookout where all donations went to support Off the Streets. In addition to the outside fundraisers that St. Mary’s Alumnae Club organized, they also spent time throughout the year bringing dinners to the women in the Off the Streets program. CUB is very grateful to be partnered with such a generous and caring group and appreciates St. Mary’s Alumnae Club’s hard work and support of the OTS program.